Information asymmetry is another argument used by NBR to explain the massive intervention in the FX market in October 2008. As I said before, I think the size of that intervention was exaggerated not due to the size per se but to the fact that it was unsterilized. But, what asymmetry are they talking about? Lucian Croitoru in his study (in Romanian only unfortunately) claims that “speculators” were using a second generation currency crisis model to justify their attack on the Romanian currency while the central banks had a third generation crisis model in mind when it intervened. Translation: Speculators believed that NBR will accept a RON depreciation to support aggregate demand. However, the central bank chose to respond to the speculative attack in order to preserve the financial stability and implicitly to minimize the fall in output. In my first posts about this event I showed that there is direct link between the negative monetary policy shock and output fall in 2008 and 2009(link here). Also, I showed that monetary policy responded correctly in 2008 because it was not following an Inflation Targeting regime but an Exchange Rate targeting regime (link here). Therefore, today I want to first look at the two types of theoretical models and identify the difference. Then we will see if NBR acted as it has claimed in the article. The second-generation models were suggested by Obstfeld (1994), Eichengreen, Rose, and Wyplosz (1997), and are used to explain self-fulfilling contagious currency crises. These models suggest that such a scenario would be happening via trade channel or via neighboring trade partners or via or via financial channel. However, the models do not offer any policy prescriptions. In general under these models it was accepted that a typical prescription for a currency crisis is to raise interest rates, prevent capital outflows and increase demand for domestic currency. The third generation currency crisis models suggested by Krugman (1999) and Aghion, Bacchetta, and Banarjee (2000, 2001) examine the role of monetary policy in a currency crisis. Under these models an interest rate increase can greatly affect the amount of lending and further restrict firms’ access to financial capital. Thus the third generation models suggests to keep real interest rates low and keep financial system functioning in the crisis (keep the credit channel functioning and money markets liquid). Let’s now go back to October 2008. To stop the “attack” – in my view it was just EUR demand going up globally, nothing to do with Romania – on the RON NBR intervened directly in the FX market. When the NBR intervenes to support the RON, it buys RON in exchange for EUR. However, intervention operations have implications for domestic liquidity. When the NBR buys RON there is a fall in the banking system’s holdings of RON, thereby draining cash from the domestic money market. If the NBR does not take further action, the market would be short of cash and domestic money market interest rates will rise. This is an example of unsterilized intervention. In effect, it is a tightening of monetary policy since it leads to a rise in the cash rate. Thus, to maintain the interest rate at the same level the NBR has to introduce via its own instruments back in the money market the RON extracted via the FX interventions. Here is the data to see the effects. 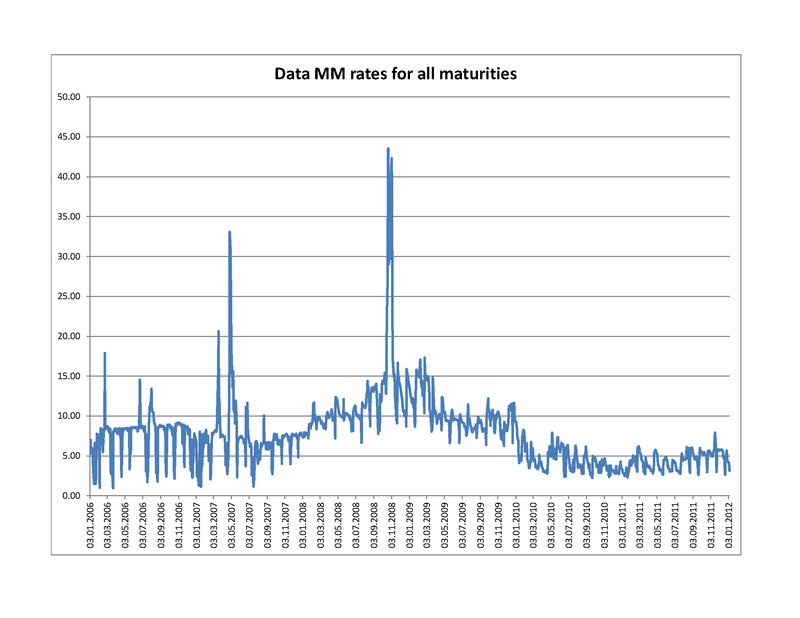 Money market rates shot up (you see here a weighted average for all maturities but I am telling you at short term it was really bad). Very important to note here is that money market rates are not reliable after November 2011 as the central bank has imposed a cap on rates. 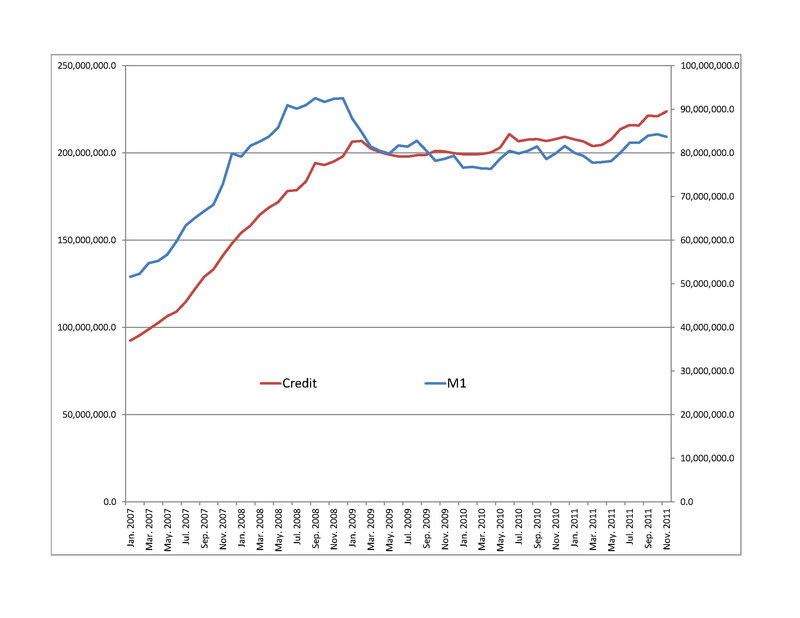 A better sense of the effect of the intervention is given by the next graph: M1 vs. Private sector credit. What’s the conclusion today? While NBR claims that it acted in accordance with policies prescriptions from a 3rd generation models in fact it acted using the old recipe to deal with what wrongly it perceived as speculative attack: tightening monetary policy. Thus, while Romania was suffering from an external negative shock via capital outflow channel the NBR delivered a second negative shock by tightening monetary policy and short-circuiting the credit channel.